Hope to land and sweet and tasty jackpot or 2 in Fruit Case, a 5 reel, 20 payline video slot from NetEnt. The action takes place here using an Avalanche Reels game engine where wild multipliers can boost payouts by up to 8x. There’s also a bonus round that awards up to 20 free spins. Play this colourful title on your PC, tablet or mobile device from between 20p and £100 per spin. The setting here is some kind of jam factory. The lower value royals appear in jars and offers payouts of up to 2.5 times your bet per payline. More rewarding are the quartet of smiling fruit characters. You’ll see pears which pay up to 5 times your bet per line, lemons which award up to 25 times your bet and oranges which deliver up to 50 times your bet. The best-paying symbol is the strawberry. Land 3, 4 or 5 of these for a payout of 2.5, 10 or 100 times your bet. 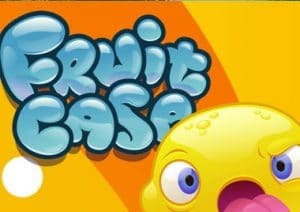 The Fruit Case logo is the wild. It replaces all other symbols apart from the scatter. The action in Fruit Case takes place using the Avalanche feature – after a winning combination hits, the successful symbols are crushed with new symbols falling into the gaps they leave. Hope to land a wild win during one of these Avalanches as it delivers a multiplier boost to your payout. The more successive Avalanche drops in succession, the bigger the potential multipliers. The first avalanche gets a 2x wild multiplier boost. That increases to 4x on the second avalanche and 6x on the third. If you’re lucky to land 4 or more Avalanches in a row, wild wins rocket by 8x! The other main feature of the gameplay here is the Free Fall feature – to trigger it, you’ll need to 3 Free Fall symbols (the blender full of juice) on the same spin. You’ll then receive a 3 times bet payout followed by 10 free drops/spins. Re-triggers are possible here too. The Avalanche drops and multipliers also come into play meaning up to an 8x wild multiplier on every free spin. NetEnt has kept things simple here. The design is done cartoon style and works well enough. The gameplay is equally straightforward. The wild multipliers can quickly get the coins moving if you get on a roll with the Avalanches though – you can win 2,400 times your bet on each spin/free spin with the 8x wild multiplier. There’s nothing complicated about Fruit Case. The bright and bold visuals are matched by the gameplay. It might be a little too cutesy for some tastes but if you like Avalanche reels video slots, then Fruit Case a game to consider. I would also advise you play NetEnt’s Gonzo’s Quest which uses the Avalanche feature but is better graphically and in terms of gameplay.